Can you get a whiteboard with music staff lines? 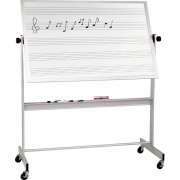 Music whiteboards provide permanent lines so it is easy to write out notes. When leading a music class or band practice, it is helpful to have a board with permanent music lines so everyone can clearly see which part of the piece is being focused on. Permanent lines on music staff whiteboards are helpful in other contexts as well. They can be used when teaching handwriting, or in any other application where straight lines are needed. Hertz Furniture has wall-mounted and mobile music dry erase boards so you can choose your ideal arrangement. What are the benefits of a portable music whiteboard? 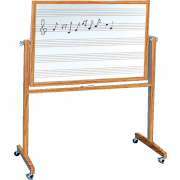 Mobile music whiteboards are ideal for any place where rooms are used for a number of purposes. If you don’t have a separate band practice room or music classroom, it is unlikely that teachers of other subjects will want to have permanent lines going across the dry erase board. When you have a mobile music staff dry erase board, you don’t have to worry about getting access to the same room every time you have a music lesson. Instead, you can simply wheel the board into the classroom you are using and have everything you need, no matter where you are. An additional benefit keeping your music staff whiteboard portable is that it will provide twice as much work space. With double-sided music dry erase boards, teachers can feel free to fill-up the whole space, and simply flip the board over when they need more room. If there is a desire to reference or return to the notes which were written at the beginning of a lesson, the board can simply be flipped back over, and everything will be exactly where it was. This arrangement also saves the time it would take to erase the board in the middle of a class. Do you have boards with music staff lines on one side? We have mobile boards which include a music staff whiteboard on one side and a natural cork board on the other. This is great when you want to have some extra hanging space, while still having the lines that are needed for music lessons. The cork side can be used to display announcements when there are no lessons going on in that particular space. When band practice is beginning, the board can be simply flipped to the music whiteboard side . What is the best kind of music whiteboard? 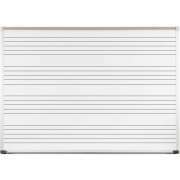 A classy school that cares about arts education and has the space and resources to furnish a designated band room or music room might prefer a wall-mounted music dry erase board. Our music staff white boards come in a number of different sizes to fit in the wall space you have allotted. A built-in marker tray running along the bottom of the whiteboard provides a convenient space for writing implements so instructors don’t have to constantly be holding them or rummaging around to figure out where they are. 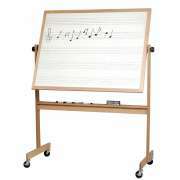 Best Rite dry erase music staff boards are designed for years of recitals, debuts and encore performances. The black lines running across these music boards won’t fade, even with repeated use and erasing. When you need to zoom in on notes, scales or chords, these music whiteboards provide a reliable space to harness student talent and provide clear instruction. At Hertz Furniture, we know how important it is to have music in the educational environment. That’s why we provide all of the equipment you need to furnish a music room or band room in your school. Our music boards are designed to make lessons easier for instructors and clearer for students, so everyone can enjoy the experience.